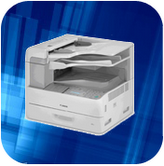 Facsimile products from Canon and Savin have set the industry standard for high quality, plain paper faxes. High speed modems, fast scanning, enormous document memories and crisp, laser output keep faxing productivity at its peak. Features vary by model. Here are some features you can expect to see. Choose Canon or Savin by clicking on the logo below.